Eric here reporting on the southbound voyage of Still Waters II. Before leaving Top Rack Marina on Friday morning, the crew topped off the fuel tanks. After taking on fuel the crew headed south on the Virginia Cut route. The crew anchored out Friday and Saturday nights, then pulled into the River Forest Manor and Marina in Belhaven, North Carolina early on Sunday. There are two routes south from Norfolk to cross the Albemarle Sound. 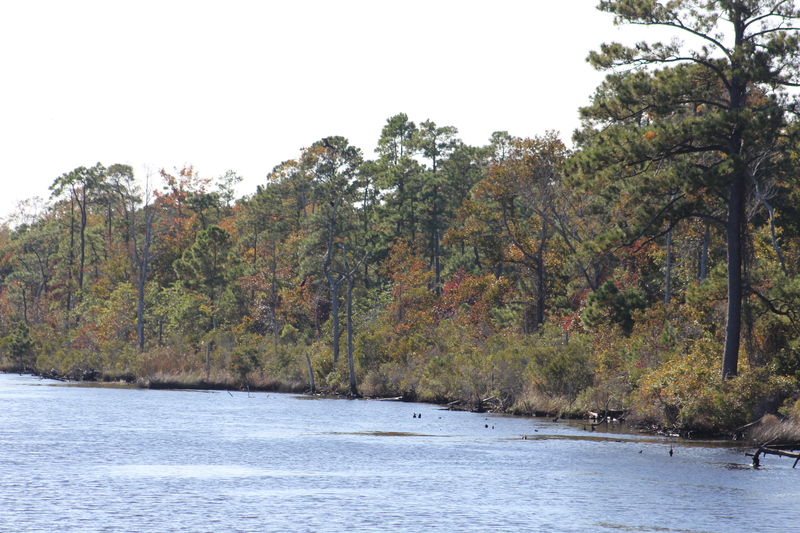 The Dismal Swamp and the Virginia Cut. 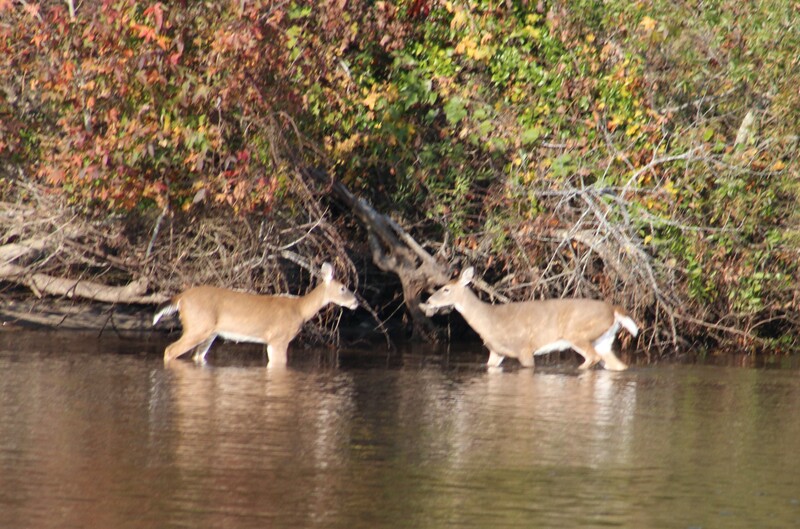 Since the crew took the Dismal Swamp route on the way north, they decided to try the Virginia Cut on the way south. 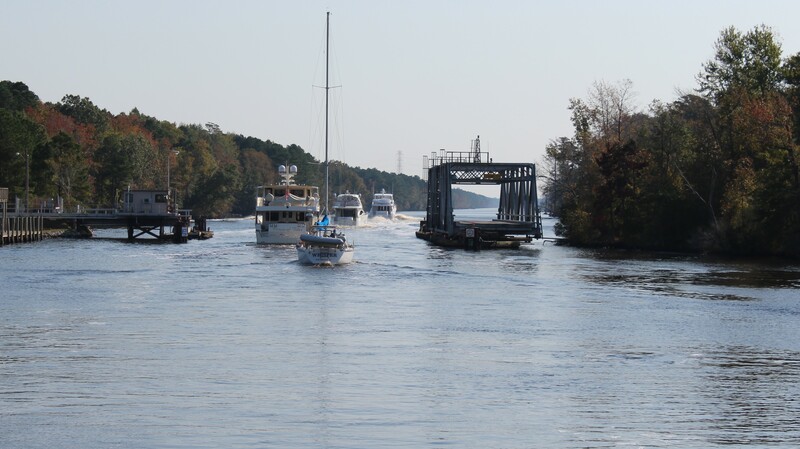 The Virginia Cut has one lock to navigate and several bridges that are on set opening schedules. So the way takes some patience and coordinating. The Great Bridge Lock was the first obstacle to time. The lock operates on the hour and the crew arrived at 0953. A tug had just passed through so the lock gates were open and Still Waters II motored into the lock and took her place along the south wall. 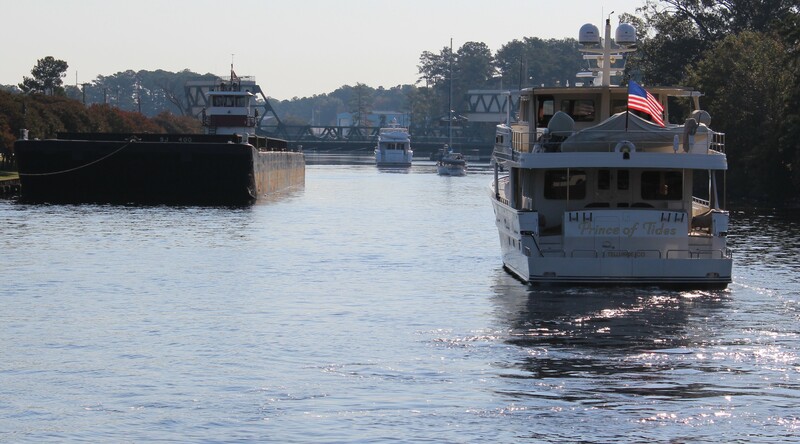 She was the fourth boat in the lock and one additional boat pulled in behind her. The gates were closed and the lock master raised the water level about a foot and opened the south bound gates. All five boats exited the lock with no issues and were headed to the Great Bridge for the 1000 opening. Next was the Centerville Turnpike Swing Bridge three miles south which opens on the hour and half hour. The five boats stayed in order and all made the 1030 opening. Next up was the North Landing Swing Bridge 5 miles south. There was a sailboat that was second in line of the parade of boats and was not making much speed. There was not enough room for the three boats behind to pass so they arrived at the swing bridge at 1110 and had to wait 20 minutes for the 1130 opening. While waiting at the bridge the sailboat moved over and let the three motor boats pass. After negotiating all the obstacles and clock, the crew dropped anchor in the North River after cruising an additional five hours. With the parade of boats headed south, all of which are making different speed, and some in a hurry while others are not, the patience of some captains has begun to wear thin. Common boating curtesy is to hail the boat in front of you and request to pass. Once permission is granted the lead boat slows and the passing boat slows to minimize the wake while overtaking the lead boat. The radio was alive with chatter of boats requesting to pass. However, there are some folks in a hurry that just plow by other boaters and give off huge 3-5 foot wakes, some even larger. One of these guys got reported to the Coast Guard by several other boaters. When he passed within 15 feet of Still Waters II he threw a 7 foot wake and really rolled her. There is a special place in Sheol for people like that. On the lighter side, there are some very creative people who come up with interesting boat names so we will begin to feature the boat name of the day as the crew journeys south. 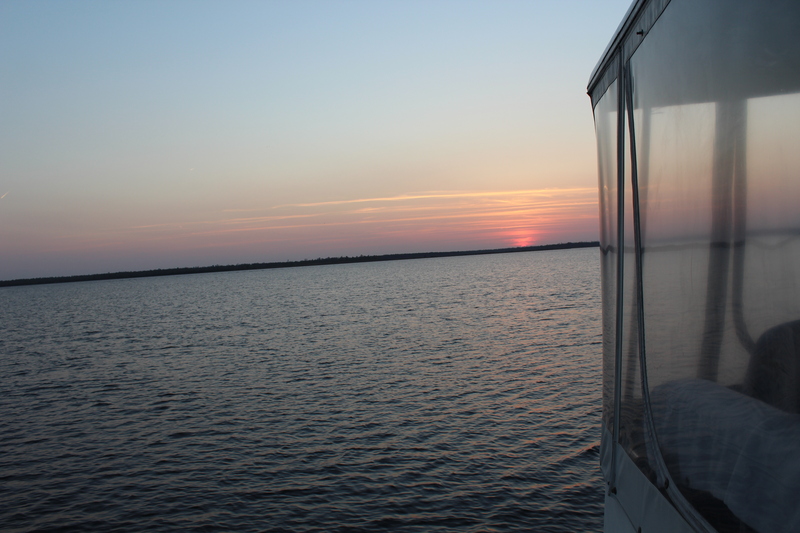 The crew logged a 70 mile voyage and crossed the Albemarle Sound. The plan was to get across the Sound in the morning before the winds got up and caused the big waves that the Albemarle is famous for. The Sound is also known for ‘confused seas’ which means waves from all directions. The Sound did not disappoint. The wind was out of the north/northeast at 15 mph with gusts to 20. This made for 3-5 foot waves coming from all quarters and a bit of a rough ride across. However, the skipper is getting better at finding the right speed to cruise the rougher water to make for a smoother ride. He has been getting more practice than he wished for, but hey, practice makes perfect. After crossing the Sound the crew entered the Alligator River with plans to stop at the Alligator River Marina for lunch and one of Wanda’s excellent hamburgers. Unfortunately, when the skipper called Wanda to ensure that they could dock, she informed the crew that the low tide was very low and they would not be able to get into the marina. 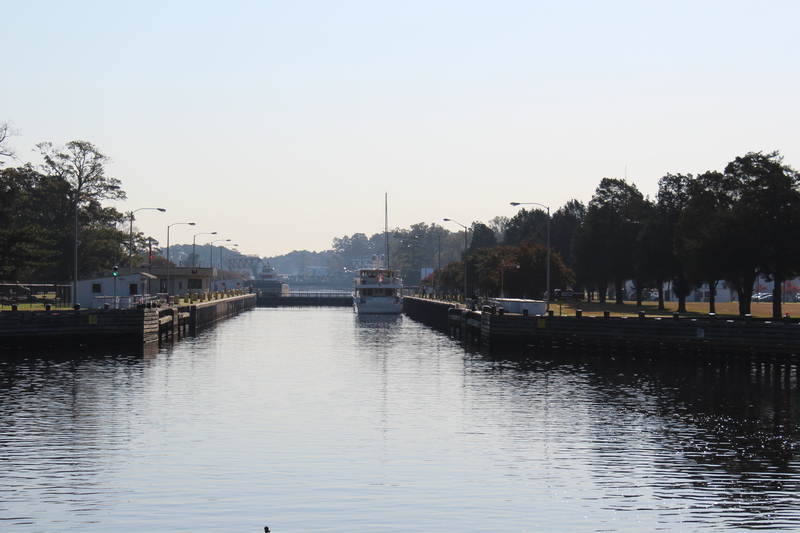 Since there would be no stopping the crew passed the marina and headed for the Alligator River-Pungo River Canal. The canal was a 25 mile long welcome escape from the wind and waves. After exiting the canal, the crew dropped anchor in a crowd of about a dozen other boats in the Pungo River. Lesson Learned – One should carry a radio onboard and monitor Channel 16 while underway. You just never know what you might need to know. The crew weighed anchor and made 15 miles to the River Forest Manor and Marina in Belhaven, North Carolina, AKA “Beautiful Harbor.” The crew needed to provision and there was a grocery store about 1.5 miles from the marina. The marina offers courtesy golf carts and the crew used them to make the provisioning run to the store. New experience cruising through town on a golf cart. The marina is under new ownership and the owners have spent the last year performing upgrades to the marina. The owners and dock hands were very friendly and provided excellent service. 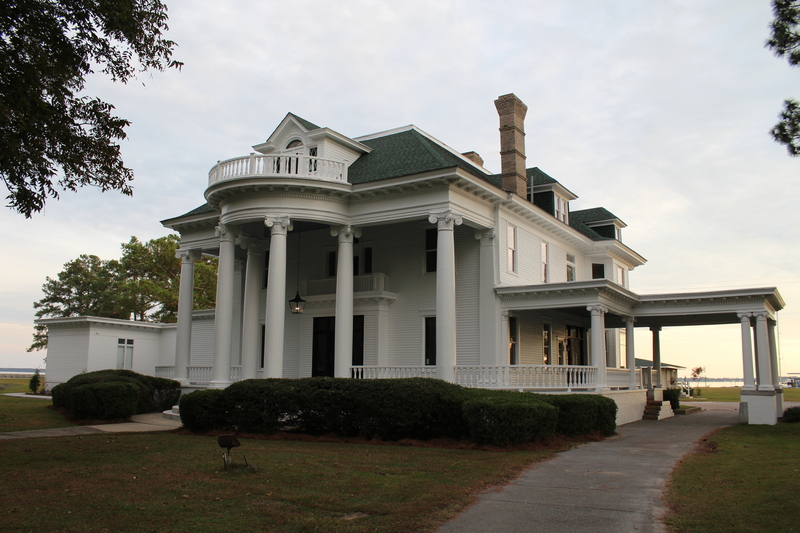 The marina owners are now in the process of restoring the River Forest Manor that was built in 1899. 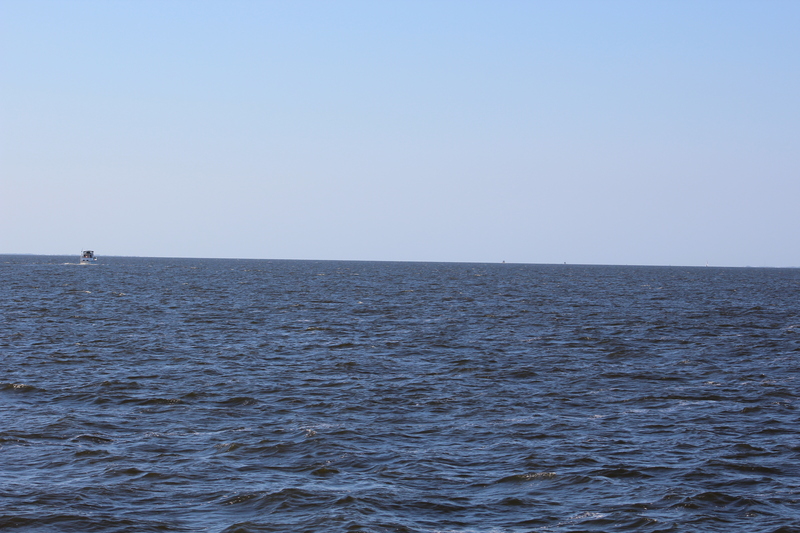 The next big challenge is to cross back through the edge of the Pamlico Sound. The weather report is for 15 mph winds on Monday, but the winds are going to grow to 20 mph on Tuesday. The talk of the dock was about who was going and who was staying. For those staying, the talk was for how long to stay before a good weather window. Our crew has decided to venture out and cross with the 15 mph winds. The winds should be north/ northeast and only cause a problem for about an hour. Keep a look out for the next log entry as I describe the wisdom or folly of the decision. Till then may the wind be in your back and you find still waters.